Been out of the loop for a bit, glad to see the coin is already in development. Ready to get in on it whenever it is done! It looks like people would like the coin to be gold! So, we know what the location side will be, we know it will be ribbed, in gold, and we'll order both colour and regular coins. But! We still need to figure out what will be on the Gaming side. And I made an image with the PAX coat of arms with, "It's dangerous to go alone! Take this" around it. I'm going to throw in a few votes for "It's dangerous to go alone! Take this."... 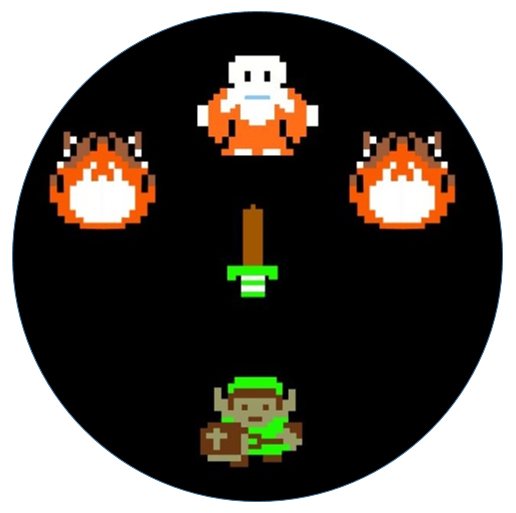 Ideally, I'd love to see the old man giving Link the challenge coin, but even the crest with that text works. The scene with the old man and Link may prove difficult as the coin itself would be tiny. On the other hand, having an 8-bit coin (like the ones from Super Mario Bros) would be kind of awesome. If we end up doing two coins (one color and one non-color), is it possible to do one in gold and one in the second place silver for added variety? Didn't know if this tacks on considerable cost or if that was an option. Nah, the company would have to make a whole new mold just for our coins, rather than just changing the face molds. Would end up costing the company far too much, plus they would make a minimum order number of say, ten thousand or so. Also I vote that the color version(If there is one this year) To be gold, and perhaps the black and white to be silver. Hence the “if only...lol” part. Not realistic, but would be cool if they could. all the polls closed, so what is the art we are looking at at this point. I haven't overlooked posts of the pictures, have I? 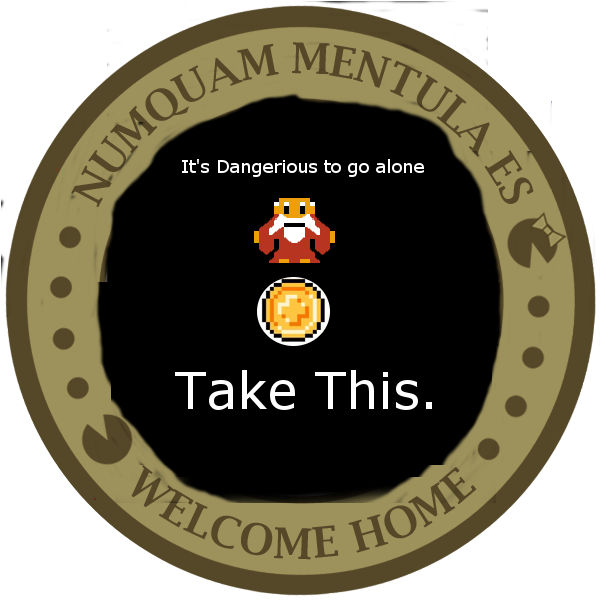 Here is my bad Photoshop version of the coin. Thoughts? I think in order to make the text uniform size and allow more room for the graphics, we should also have "It's dangerous to go alone!" and "Take this." be in semi circles above and below the graphics. Then the man and the coin can be a little bit bigger. Also, in the game, all of the letters are capitalized. Should we follow suit? I'd vote for keeping it as authentic as we can in terms of size/punctuation, with the exception of bending the text in semi circles in order to fit the curve of the coin. What was ultimately decided ? Riverwalk boat, and "Take This"?  It would be kind of cool to kind of redesign the "Take This" side. I would rather it just have the sword, personally. And I don't know if the reverse wording could have the Latin for "It Is Dangerous to Go Alone"=Periculosum est solus, and "Take This"=hanc (or if that's even the accurate translation (from Google Translate). Here is what I've gotten from Kiddercorp. Dang. I know it's all final, but I just don't like the two rows of words around the game side of the coin. And what is the circle with the cross in it? Why isn't the sword there? It seems out of place not being pixelated like the old man. I'm so particular and picky, I know. I'll still buy whatever we have decided upon, because this whole PAX challenge coin thing is rad. And, of course, there's a typo there. You have ALONE1, instead of ALONE! When I put "numquam mentula es" into Google Translate, it translates it to "you never prick". Lol. I can see how the curved words would be odd. What would a good alternative be? I think the curved words are fine. Sure they look a bit weird, but eh. I think the small coin the man is giving probably needs to change. If we are brainstorming this, the coin should be an 8bit coin (with the hard edges) like in Super Mario Brothers, or if we want to keep with the Zelda theme, it can be one of the diamond shaped coins in the Zelda game. The smooth round coin kind of hints at it being the smaller version of the challenge coin, but it looks out of place. How can we translate that he is giving the challenge coin to link? That is the real question. I don't know if is possible, but if they could somehow shrink the design from the front of the challenge coin to fit into the small challenge coin in the pic, that would accomplish it. I just think that it is too small to make that happen. 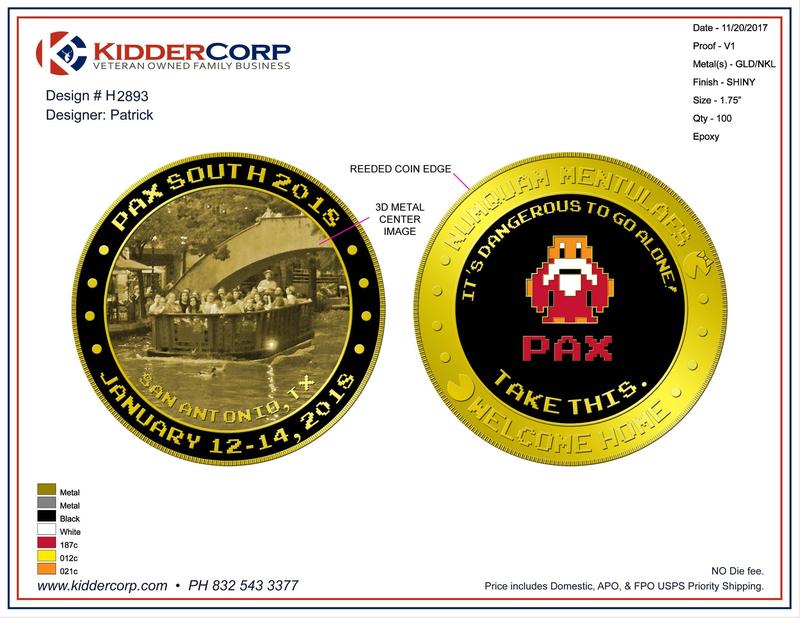 The other option is to change the coin to an 8bit version and have "PAX" inside of it where the cross is? I think overall we are very close. The only issue I see is the small coin in the graphic not being 8bit and not really conveying that it is the PAX challenge coin being given to Link. Change 1 to ! after "ALONE"
So, looks like Kiddercorp can fix all of the things except for making the coin pixelated. They understand why we'd like it like that, but it wouldn't come out well unless they used a photo mat (like in 2016). Do people have any thoughts? 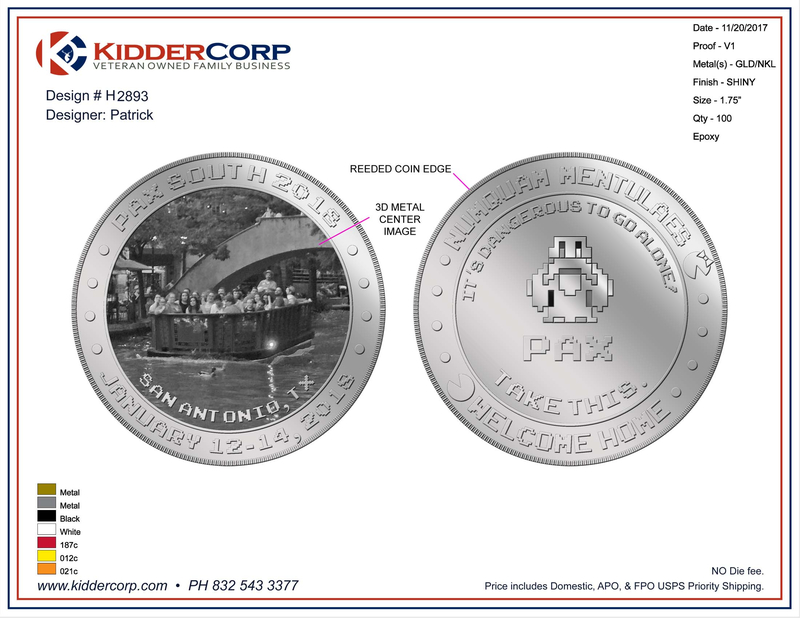 Here are the fixes they have done and suggested putting PAX instead of a coin. Thoughts? Would the "Take This" text look better without the period? Are we allowed to use the PAX logo typefont? (See pic below). 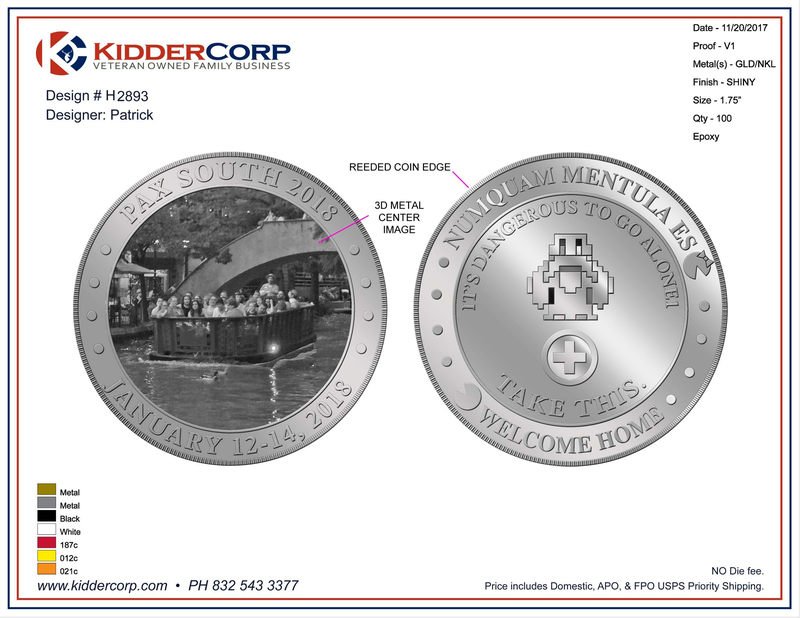 If so, would it be feasible to put it on the coin in place of the "PAX" text? 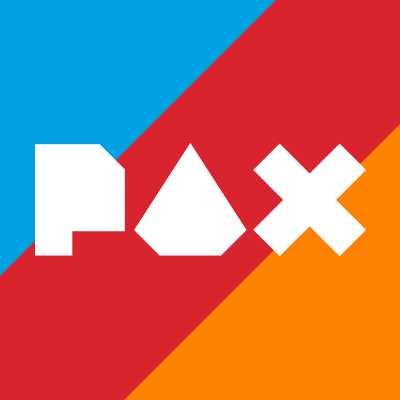 Assuming number 2 is a no-go, can we change the "PAX" text to an orange color? 4) I just noticed there are two 2018s on the location side, do we want to take one out or leave them in? If out, which one? "The reason is how enamel coins are painted. The act of painting these means we need lines between each color. The pixel boxes would end up making each one look very strange." Understood on #2. I figured that would be the case, but thought it good to ask. Good catch on the "2018". I didn't see that either until you pointed it out. I think omitting the bottom "2018" would look the best. I think the idea of the old man giving the "PAX" is a cool idea. I keep trying to think if there are any other "unofficial" PAX icons/inside-jokes/things related to PAX that are well-known throughout the community that could replace the text, but I can't really think of any at the moment. At least none that are not already licensed. This might be a crazy idea, but would it be hard to turn the "PAX" text into a badge instead? I think that'd be pretty cool if the old guy was handing you a PAX badge. My fear is that it would just be a colored square, which would obviously defeat the purpose, but any thoughts on this? Removing the bottom ",2018" would be my vote since its already PAX South 2018, so the 2018 on the date is implied. Welp, I think what we have now is pretty cool! 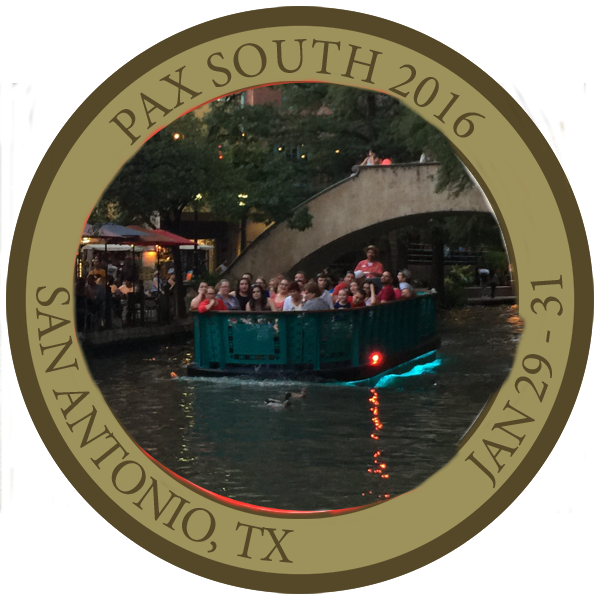 If the "PAX" is changed to orange, it'll really tie in with PAX South.